CLERMONT, KY–(Marketwired – Feb 19, 2014) – In honor of 25 years, Booker’s® Bourbon is giving bourbon enthusiasts a reason to celebrate with a limited edition release of an exclusive bottling that is the most unique liquid produced to date. Batch No. 2014-1 pays homage to its namesake, 6th Generation Beam Master Distiller, Booker Noe, who was a lot like his favorite bourbon: uncut, unfiltered and straight up. To mark this occasion in bourbon history, Booker’s son, Beam Family’s 7th Generation Master Distiller and 2013 Bourbon Hall of Fame Inductee, Fred Noe, and Booker’s grandson, Freddie Noe, selected barrels that were aged longer than any Booker’s® Bourbon batch to-date — ensuring an exceptional, one-of-a-kind flavor to honor Booker and his legacy. The barrels were among the last that Booker laid down in the rack house before he passed away. With a robust vanilla nose and wide range of flavors — from oak tannin to mocha notes — this exclusive and extremely limited batch has a deep taste with a smooth finish. Booker’s® Bourbon, inspired by a 200-year-old family tradition, came to life when Booker Noe selected the first bottles of Booker’s® as holiday gifts for his friends and family. With its instant popularity within Noe’s close circle, Booker’s® Bourbon was soon after bottled and made available on shelves for everyone to enjoy. 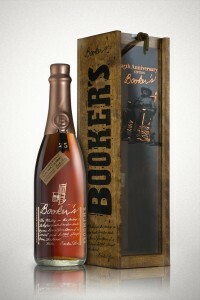 Twenty-five years later, Booker’s® Bourbon Batch No. 2014-1 is taken from the center-cut of Booker’s favorite rack house, bottled at its natural proof, uncut, unfiltered and extra aged to bring out the true flavor profile of this small batch bourbon.